Golf Vacations UK Ltd is a service dedicated to providing quality golf and accommodation to destinations throughout Ireland, Scotland and the United Kingdom. We provide fully inclusive tailor made self drive or escorted golf vacation packages for small or large groups. 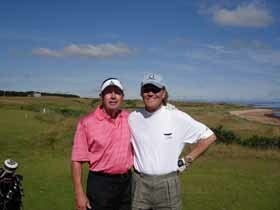 We will obtain tee times on major championship courses throughout the United Kingdom. Contact us now for a competitive quote. “Just a quick note to thank you for arranging a fabulous golf vacation for Glen Campbell, myself and our wives this past summer … we had the time of our lives!! At the conclusion of Glen’s first UK concert tour in many, many years we were delighted to spend the next couple of weeks playing some fantastic courses in Scotland and Ireland. You were amazing in seeing that every detail was arranged for and that we never needed to worry about anything. The golf was incredible, … the caddies, transport drivers and everyone else we met during our stay couldn’t have been nicer.